1 of 4 Heat oven to 375 F. In large bowl, mix beans, chile peppers, corn, chili powder, salt and cumin. Slightly mash beans; stir to combine. Add 1 cup cheese. 2 of 4 In medium-size bowl, stir together two cans enchilada sauce. Stir 1 cup of the enchilada sauce into bean mixture. 3 of 4 Spread 1/4 cup of the remaining enchilada sauce in 13x9x2-inch baking dish. Brush one side of a tortilla with enchilada sauce. Spoon 1/4 cup of the bean mixture in center on sauced side; roll up. 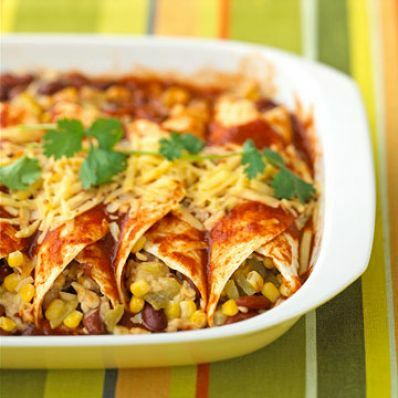 Place enchilada in baking dish. Repeat with remaining tortillas and bean mixture. Pour remaining enchilada sauce over top to cover. Top with remaining 1 cup cheese. 4 of 4 Bake at 375 F for 15 minutes. If desired, garnish with cilantro.